1 Departamento de Ciencias Biológicas Animales. Facultad de Ciencias Veterinarias y Pecuarias. We studied the lung diffusion parameters of two species of birds and two species of mammals to explore how structural and functional features may be paralleled by differences in life style or phylogenetic origin. We used two fast-flying species (one mammal and one bird), one running mammal and one bird species that flies only occasionally as models. 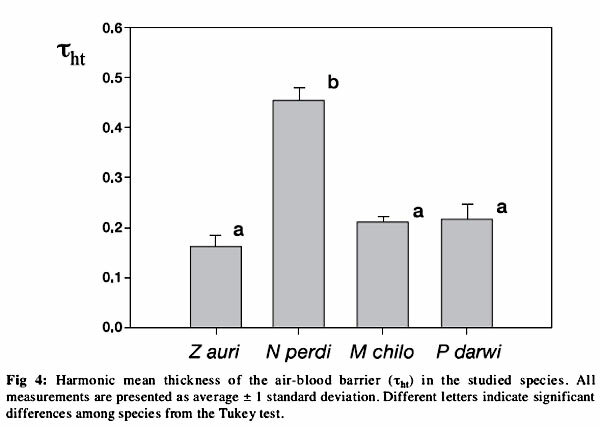 The harmonic mean thickness of the air-blood barrier was very thin in the species we studied. An exception was the Chilean tinamou Notoprocta perdicaria, which only flies occasionally. It showed an air-blood barrier as thick as that of flightless Galliformes. We found that the respiratory surface density was significantly greater in flying species compared to running species. The estimated values for the oxygen diffusion capacity, DtO2 follow the same pattern: the highest values were obtained in the flying species, the bat and the eared dove. The lowest value was in N. perdicaria. Our findings suggest that the studied species show refinements in their morphometric lung parameters commensurate to their energetic requirements as dictated by their mode of locomotion, rather than their phylogenetic origin. The air-blood barrier appears to be thin in most birds and small mammals, except those with low energetic requirements such as the Chilean tinamou. In the species we studied, the respiratory surface density appears to be the factor most responsive to the energetic requirements of flight. Key terms: diffusing capacity, lungs, flight. The morphology and the efficiency of respiratory organs correspond with the oxygen requirements of animals. Flying animals, such as birds, insects and bats, which have high aerobic capacities, appear to have the most efficient respiratory organs (Maina, 2000a; Maina and King, 1984; Mainaetal., 1991). Among extant vertebrates, flight evolved independently in birds and bats. According to their phylogenetic and morphological differences, the strategies to accomplish this energetically expensive form of locomotion appear to be different (Maina, 1998). Birds exchange gas through a process in which a wide range of pulmonary and extrapulmonary factors are integrated, operating sub-maximally (a broad-based low-keyed strategy); bats, however, appear to have a restricted number of factors operating close to their maximal levels (a narrow-based high-keyed strategy) (sensu Maina, 1998), probably related to the mammalian lung design that they possess. There is evidence that birds and bats have different methods to optimize oxygen flow. For example, the respiratory surface density of bats appears to be only slightly lower than that of non-flying mammals, but much lower than that of birds. Also, the harmonic mean thickness of the blood-gas barrier in bats is slightly thinner than that of non-flying mammals, yet thicker than that of birds (Maina, 2000b). In birds, the lung volume is lower than that of non-flying mammals, while bat lungs show the opposite trend. Although a high respiratory surface density and a thin air-blood barrier have been reported in several small bird species, such as Colibrí coruscans (Dubach, 1981), most birds have similar values of respiratory surface density and thickness of the blood-gas barrier (Maina, 2002a). However, the Orders containing non-flying birds or birds that fly occasionally (e.g., Galliformes, Struthioformes and Sphenisciformes), appear to have a thicker blood-gas barrier (Maina, 2002a). We studied the lung diffusion parameters of two species of birds and two species of mammals to explore how structural and functional features may be paralleled by differences in life style (running or flying) or phylogenetic origin (mammal or bird). To do this, two fast-flying species (one mammal and one bird), one running mammal and one bird species that flies only occasionally were used as models. We used the Leaf-eared mouse Phyllotis darwini (Rodentia: Muridae) as our running mammal model (n = 3; Mb = 75.36 ± 4.96 g where Mb is the body mass: ± 1sd), a rodent dwelling in grasslands, scrub, open forest and rocky areas. Our flying mammal model was the Mouse-eared bat Myotis chiloensis (Chiroptera: Vesperilionidae) (n = 3; Mb = 6.05 ± 0.10 g), a small bat inhabiting thickets near watercourses. The bird models were 1) the Eared dove Zenaida auriculata (Columbiformes: Columbidae) (n = 3; 141.1 ± 1.55 g), a common fast-flying bird which inhabits farm lands and urban zones from the coast to the Andes foothills; and 2) the Chilean tinamou Nothoprocta perdicaria (n = 3; 398.33 ± 11.70 g), an endemic species with a chubby body and short wings dwelling in grasslands, thickets and farmland. This species usually runs between shrubs and only occasionally makes short flights. Three adult individuals of each species were captured with mist nets or Shermann traps in central Chile during March, 2004. After capture, animals were weighed, killed by an overdose of anesthetic by intraperitoneal injection, dissected and the trachea were exteriorized and cannulated. In the case of birds we avoided injection into the air sacs. A quantity of 2.3% glutaraldehyde in phosphate buffer (ph 7.4) was introduced in the trachea (Maina 2002a). When the fixative solution exceeded the level of the trachea, we closed it and tied it to the cannula. Immediately following this procedure, the lungs were removed and immersed in the same fixative at 4°C for a minimum of 2 hours. Next, tissues (right and left lungs) were processed for routine electronic transmission microscopy. Briefly, two pieces of 1-2 mm thickness were obtained from each lobe in mammals and four randomly chosen pieces were obtained from each lung of birds. The pieces were washed with buffer and post-fixed with 1% osmium tetroxide for 1 hour at 4°C. Tissues were then dehydrated in graded concentrations of alcohol and infiltrated and embedded in epoxy resin constructing cubes of 2-3 mm3, obtaining semi-thin VUR sections of lfim. Tissue samples were stained with 1% toluidine blue. Ultrathin sections of 60-90 nm of thickness were made and mounted on copper mesh grids. These sections were contrasted with lead citrate. Sections were studied through optical and transmission electron microscopy (JEOL/JEM 100SX). Eight to twelve sections were photographed, digitalized and twelve semi-thin and twelve ultra-thin sections per individual were analyzed using Scion Image Software. of intersections between line probes of length Z with the respiratory surface and PT is the number of test points (Figure 1). is the mid-value of intercept length of linear probes, f¡ the frequency of class j and m the number of classes (Figure 2). The factor effects (taxa and locomotion type) on τh and ASd were analyzed with a two-way repeated measures ANOVA. Multiple comparisons were performed with Tukey's test. The respiratory surface density was different between mammals and birds (F63 = 123,2, p <0.01) and between flying species and running or occasionally flying species (F63 = 114,9, p < 0.01). The interaction between taxa and locomotion type was not significant (F63 = 6.59). The a posteriori Tukey analyses showed that these differences were sustained by differences between the flying bird Z. auriculata and the running mammal P. darwini. The former has a higher ASd, therefore, the difference between birds and mammals appears to be only a consequence of the high ASd of Z. auriculata. However, differences among locomotion types appear to be well sustained (Table 1 and Figure 3). The harmonic mean thickness also showed a significant effect of taxa (F6 3 = 19.15, p < 0.01), locomotion type (F63 = 26.89, p < 0.01) and interaction (F63 = 29.52; p < 0.01). 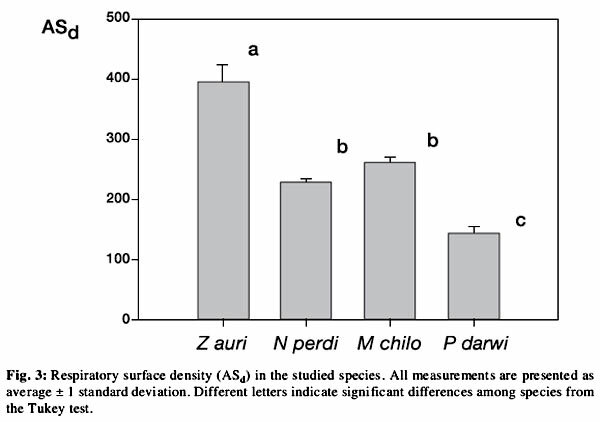 However, multiple comparisons revealed that these differences were only sustained by the thicker air-blood barrier observed in N. perdicaria (Figure 4). The oxygen diffusion capacity (D02) may be estimated from morphometric information as a theoretical capacity determined by the exchange surface and the tissue barrier (Weibel et al., 1991). 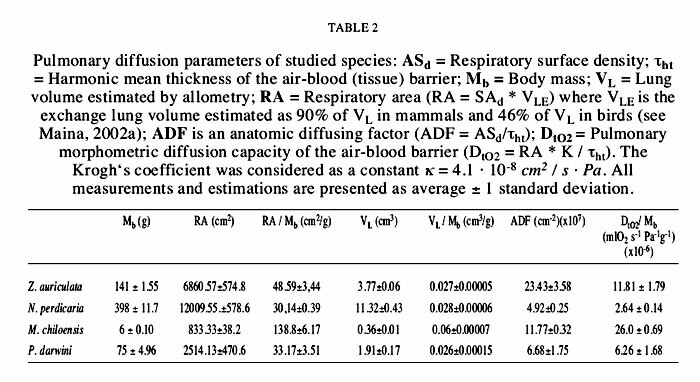 Regarding only the tissue component, the tissue oxygen diffusion capacity (DtO2) from air to plasma is determined by the harmonic mean thickness of the air-blood barrier (τht), the most appropriate estimator of the conductance (Weibel and Knight, 1964; Weibel, 1970/71), the respiratory surface density (ASd) and the lung volume (VL). In this study we only analyzed τht and ASd. Lungs of small birds with high mass-specific metabolisms (Novoa 2003) exhibit different morphometric refinements (Maina 2000a). For instance, the order Passeriformes, a group that includes 60% of extant bird species, possess more efficient lungs compared to non-passerine species. In contrast, soaring and gliding birds, need less energy during flight and appear to have relatively less efficient lungs (Vitali and Richardson, 1998; Maina, 2000a; 2002a). The highest value of τht was found in the tinamou N. perdicaria (0.469 ± 0.02 µm). This is the first report to date of measurements of the lung parameters for any Tinamiform, so we cannot compare our results with those from closely related species. However, N. perdicaria has a thicker air-blood barrier than most bird species studied to date. Most birds have a lower τht, in general ranging between 0.099 and 0.385 µm. Only Struthio camelus and Spheniscus humboldti have τht of roughly 0.5 µm (Maina, 2002a). The value of τht in N. perdicaria approaches those of Galliformes species, which range from 0.318-0.346 [im in the domestic fowl Gallus gallus to 0.385 µm in Meleagris gallopavo. The flightless domestic galliform species have relatively thicker air-blood barriers, lower respiratory surface areas and pulmonary diffusing capacities compared to species with higher energetic requirements (Maina, 2002a; 2002b). This may be also the case for N. perdicaria. Other members of Ratites have dissimilar thicknesses of the air-blood barrier, 0.530 urn in Struthio camelus (Struthioformes) and 0.232 µm in Dromaius novaehollandiae (Casuariiformes), suggesting that phylogenetic origin is not responsible. The respiratory surface density showed strong differences between flying and "non-flying" species. The highest values were observed in the dove Z. auriculata (310.29 ± 17.5 mm-1) and the bat M. chiloensis (202.03 ± 7.1 mm-1). Zenaida auriculata exhibits values in the range of other fast-flying birds, such as Columba livia (302 mm-1) and several Passeriformes (≈ 300 mm-1) (Maina, 2002a). The respiratory surface density of the bat M. chiloensis was higher than those of the small shrews, 121 mm-1 on average (Gehr et al., 1981), and those of several bats spp. (see Maina et al., 1982). The running mammal P. darwini and the occasionally flying N. perdicaria showed low respiratory surface density. The former has values similar to other non-flying mammals, but N. perdicaria has a low value only comparable to the domestic Galliformes and great non-flying birds such as Struthio camelus and Dromaius novaehollandiae. The thickness of the air-blood barrier and the respiratory surface density do not determine uniquely the oxygen diffusion capacity. Estimating lung volume from allometric relationships, considering 90 and 46% of lung volume as parenchymal volume in mammals and birds respectively (Maina, 2002a) and using a constant value for the Krogh's diffusion coefficient κ - 4.1  10-8 cm2 / s  Pa because this is not greatly influenced by temperature (Maina 2002a), we estimated the mass-specific oxygen diffusion capacity (DtO2/Mb) for the studied species (Table 2). According to these estimations, the bat and the dove have much greater diffusion capacity than the other species. During flight, the energetic requirements of bats are comparable to that of birds (Jurgens et al., 1981). Birds satisfy these requirements by means of morphological specializations, such as fine subdivision of exchange tissue and thinner air-blood barrier, among others. The respiratory surface density, a variable that denotes the relative size of the terminal gas exchange components, has been reported as substantially greater in the avian lung than in the lungs of bats and the non-flying mammals (Maina 2000a; 2002b). However, the respiratory surface density of the species studied in this work appears to be high in good flyers, the bat and dove spp., but not in the occasionally flying bird N. perdicaria. This finding suggests a differential morphometry in response to energetic demands. Since bats achieve high oxygen consumption during flight (Norberg, 1987; Thomas, 1987) without cross-current or counter-current exchange systems, their lungs show other structural adaptations such as: 1) exceptionally large lungs (and hearts) (Jurgens et al., 1981; Canals et al., 2005b), 2) relatively extensive mass specific surface area and 3) thin air-blood barrier, among others (Maina et al., 1982). The studied bat M. chiloensis has a large lung, about 0.058 cm3/g (Canals et al., 2005b,c), while shrews and hummingbirds, the most metabolically active in their respective vertebrate classes, have average values of 0.03 cm3/g (Gehr et al., 1981) and 0.043 cm3/g (Maina et al., 1982), respectively. The estimated mass specific respiratory surface area of the bat was 2.8 times that of the dove, 4.1 times that of P. darwini and 4.8 times that of N. perdicaria. It was larger than the value reported for the small hummingbird Colibrí coruscans, 87cm2/g (Maina, 2002a), but smaller than that of the small bat Epomophorus wahlbergi, 138 cm2/g (Maina et al., 1991). The estimated values for the oxygen diffusion capacity, DtO2, confirm the same pattern: the highest values in the good fliers, the bat and the Eared dove, and the lowest value in the Chilean tinamou. The DtO2 of M. chiloensis was greater than that of Pipistrellus pipistrellus (12.8x10-6 mlO2/ Pa s g) and close to that of E. wahlbergi (23.5x10-6 ml02/Pa s g), these are two small bats with very high DtO2 (Maina et al., 1982; Maina and King, 1984). Z. auriculata showed a DtO2 close to C. livia (10.0x10-6 m102/Pa s g) and several other Columbiformes (Maina, 2002a). P. darwini showed a DtO2 close to M. musculus (4.2x10-6 m102/Pa s g) (Gehr et al., 1981) and N. perdicaria showed the lowest DtO2 which is close to the domestic fowl and the ostrich, both representatives of non-flying birds. Considering the allometric relationships for the total oxygen diffusion capacity from air to to red cells, DLO2: DLO2 (birds) = 7.19  Mb0.9198; DLO2 (bats) =25.96  Mb0.6240 and DLO2 (nonflyingmammals)  5.92  Mb0.9513, where Mb is in grams and DLO2 in mm3O2 min-1mmHg-1 and the observation that DLO2 is about 1/10 of DtO2 (DLO2/DtO2 ratio = 0.092 ± 0.07 in birds and 0.10 ± 0.031 in bats) (Canals et al., 2005a), we did estimate the expected DtO2 value for the species we studied. These values were 6.06x10-6 mlO2 s-1Pa-1g-1 for the dove; 5.57x10-6 mlO2 s-1Pa-1g-1 for the Chilean tinamou; 16.69x10-6 mlO2 s-1Pa-1g-1 for the bat and 6.01x10-6 mlO2 s-1Pa-1g-1 for P. darwini. The values that we obtained represented 153.13%; 37.14%; 122.22% and 81.86% of those expected values respectively, reinforcing the idea that good flying species have greater oxygen diffusion capacities despite body mass differences. In short, the studied species showed refinements in their morphometric lung parameters in response to energetic requirements associated mainly with their form of locomotion, rather than their phylogenetic origin. The air-blood barrier appears to be thin in most birds and small mammals, except those with low energetic requirements such as the Chilean tinamou. In the species we studied, the respiratory surface density appears to be the main factor responding to the energetic requirements of flight. However in the bats large lungs contribute to high oxygen diffusion capacity paralleling their high metabolic demand for oxygen. Since the context in which the interplay described in this work is allometric we would expect such interplay to hold true over a vast range of animals of different body weights. We thank Bradley Bakken and Lafayette Eaton for revising the English. This work was supported by the FONDECYT 1040649 grant to MCL.